Anchors Cavern. Dark gray anchors on a white background. The background is printed with various nautical items in pale gray. Screen printed on spun polyester and perfect for outdoor settings and indoors in sunny rooms. It is fade resistant up to 500 hours of direct sun exposure. Create decorative toss pillows, chair pads, placemats and tote bags. To maintain the life of the fabric bring indoors when not in use. This fabric has been treated for outdoor use. 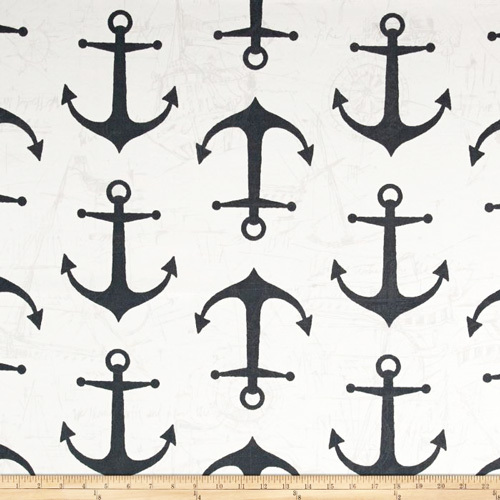 A: The background has a shadow print of various nautical items in a pale gray color.